BuffaloGrid is a truly scalable solution to the power deficit in the developing world: pay-as-you-go phone charging at a network of solar-power hubs in some of the world’s poorest communities. 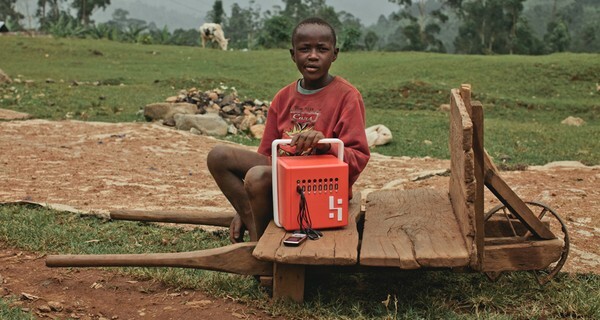 The idea came to Phil Schluter, the head of a coffee trading company which has been operating in rural Africa for decades, when he saw the profound impact mobile phones were having on rural people's socio-economic prospects across sub Sahara Africa, and the lengths to which people had to go to recharge them. An estimated 650 million cellphone users are off-grid and have to walk long distances to find very costly power, often from car batteries. He also realised people had a profound lack of faith in solar as a power source because the inexpensive units they could afford would so often break. So, instead of selling personal solar units to the consumer directly, his solution was to give BuffaloGrid hubs- a portable solar charging unit - for free to local entrepreneurs and then run with them the service of providing convenient power to their communities. This means people in poor, rural communities have access to a reliable power source without having to financially invest in the technology themselves. Each BuffaloGrid hub consists of a 60-watt solar panel that charges a battery. Local entrepreneurs manage the unit and its charging ports - taking 50% of the revenue themselves - and consumers unlock these charge-ports by sending a premium text message to Buffalo Grid. Each unit costs £250 and generates £300 a quarter based on charging 40 phones a day. Schluter says, ‘Our innovation was in the distribution system: [allowing] us to administrate the unit remotely, lower operating costs and keep track of the performance of the unit.’ As well as letting people buy cheap power themselves, BuffaloGrid is actively encouraging local telco networks to subsidise their customers’ use of the hubs by giving power credits as part of their mobile packages: BuffaloGrid argues the result will be they will use the telcos’ services more. Whoever ends up paying, the hubs massively cut the cost of charging, which can cost a rural Ugandan as much as a fifth of his daily wage, or 20 cents of an income of $1 a day. BuffaloGrid units offers cheaper, sometimes even free, power depending on the partnership. BuffaloGrid is an organisation in a hurry: started in just 2012, it hopes to connect 1 million people to power over the next three years, and employ 8,000 entrepreneurs, hitting revenues of $40 million by 2019. After trials in Uganda, the outfit is currently rolling out 50 hubs in India, where 300 million phone users are off-grid, and readying to expand to Brazil, Indonesia, Bangladesh and Sub-Saharan Africa.